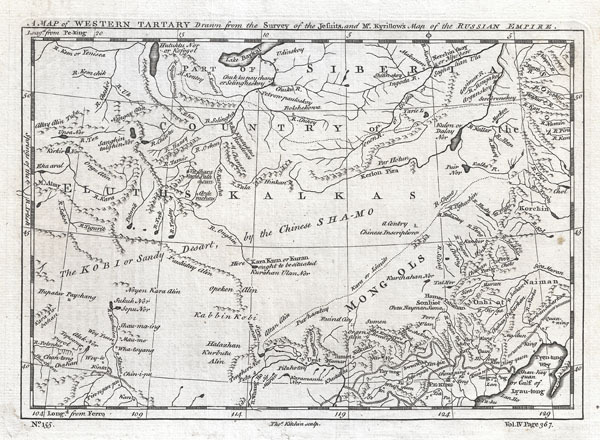 A Map of Western Tartary Drawn from the Survey of the Jesuits and Mr. Kyrillow's Map of the Russian Empire. A fascinating 1747 European mapping of the Gobi Desert and the eastern portion of the Silk Route region by Thomas Kitchin. Covers from Lake Baikal in the north as far south as Beijing, east to the Gulf of Lyau-tong (Yellow Sea), and west as far as Chan-tong. When this map was drawn the geography of this region was very poorly understood by Europeans. This map is generally derived from Jesuit missionary reports and the large map of the Russian Empire prepared by Kyrillow. Depicts the Great Wall of China, various caravan routes, supposed rivers and settlements, and various Nor (or lakes) in the region. This wonderful map offers a wealth of valuable detail for anyone with an interest in the eastern portions of the ancient Silk Route. Notes the supposed site of Kurahan Ulan Nor right in the center of the Gobi Desert. This was supposedly the ancient capital of the Mongol Empire until Kublai Khan moved it. Also notes a number of ruined cities and other places of interest. Prepared as map no. 155 by T. Kitchin for Thomas Astley's A New General Collections of Voyages and Travels, volume IV. Astley, Thomas, A New General Collections of Voyages and Travels, London, 1747. Very good. Clean dark impression. Blank on verso. Original platemark visible.